Download ChemPlayer 2019 setup installer 64 bit and 32 bit latest version free for windows 10, Windows 7 and Windows 8.1. 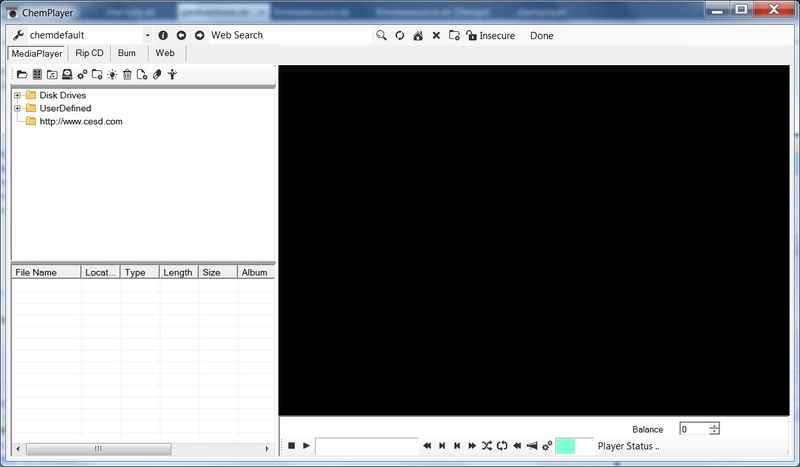 ChemPlayer provides a media player and web browser. Plays of various types music (mp3,wma,wav, flac etc) and video files (DVD,avi, mp4, vob etc). Provides cdrom ripping and burning interfaces. Web browse and listen/play all in the one package. 2017-06-11 (246). Malware Test (246): 100% Safe Tested & Virus/Malware Free. your music and video playing experience more entertaining, manageable and simple. Features user-friendly interfaces that can be adjusted via the settings options. ChemPlayer for Windows 10, 7 and other prevoius windows versions. How to uninstall (remove) ChemPlayer Completely? Softati.com - does not store ChemPlayer patchs, serial numbers, activation, cracks, license key, keygen or any forbidden files that may cause harm to the original developer. Only free direct download for the original developer distributable setup files. ChemPlayer is developed and maintained by ChemEng Software Design, Softati.com is not affiliated with this software developers by any means. All trademarks, registered trademarks, product names and company names or logos mentioned herein are the property of their respective owners.